The bikes are in the crate, sitting in a warehouse in Lachine, waiting to be sent to a boat. They'll travel first to Hamburg and then to Alexandria. All in, it will take 35 days! My father and I drove to Montreal and back today. Well, he drove and I slept, er, navigated. This trip depends on a lot of people, but no one more than our parents. I've spent much of the last couple of weeks taking the bikes apart and putting them back together. I think Sam and I could have a contest over who knows the least about motorcycle maintenance. You learn a certain amount through necessity over the years, but I have not spent a lot of concentrated time learning how to maintain a bike. Thankfully, I have friends who have! A great family friend, Trevor Bachelder, has spent these two weeks with me patiently preparing the bikes for the trip. We've done a fair amount. 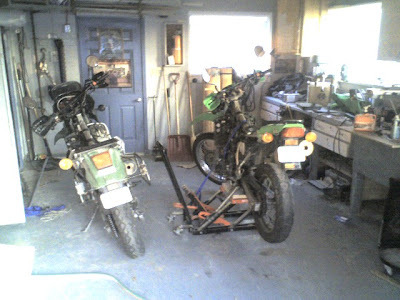 After getting the bikes back from the Toy Doctor we set to replacing the bikes subframe bolts. This involved drilling through the core of the frame of both bikes and inserting some big aviation grade bolts. 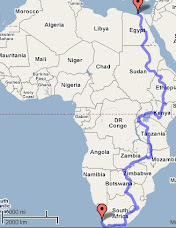 Apparently it's a good thing for the bike to not fall apart halfway across Kenya. We replaced the brake pads and fluids. We also added braided brake lines. We are taking bets on whether I or Sam are the first to do an endo in the desert. We also changed out the tires and replaced the chains and sprockets. And we added fuel filters. Meanwhile, my Dad built me a great set of pannier racks. I have no worries about these breaking during the trip. Setting the valve on a new rear tire. All this work could have been done at a shop, but this was a great chance to learn a lot about the mechanics of a bike. And you can't beat the view from my father's garage. The pictures below tell the story. The garage, right behind the house. Finally, a big thanks to Eric at A Vicious Cycle for all of his help getting us these parts. We started crating the bikes tonight. We ship them Wednesday. I will add pictures of the crating later. It's a pretty impressive and tight fit. Peter, his nephew, and the original Peter Loewen, right before taking the bike for a final spin. We drained the fluids for shipping. This is a reminder to not crank over the engine in the warehouse in Alexandria. We are about to crate the bikes. Save a few last minute additions everything has been done. By the end of Wednesday the bikes will be in a container ready to cross the Atlantic to Alexandria. After that, it's six weeks of waiting, also known as the longest Christmas Eve ever. Later in the day I'll be posting pictures of all of our preparations. In the meantime, here is a great video to watch. It's a roll of highlights from the Dakar Rally over the years set to "Smokers Outside the Hospital Door" by the Editors. It gets great around 3:30. To all interested, I'll be doing a bit on CBC Points North today at around 5:40. They've been asking about favourite road songs all week, so I'll be chatting about mine and talking about the trip. You can stream it live here. I grew up in a little piece of paradise. 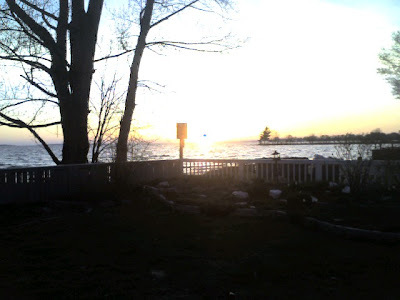 For as long as I can remember, my parents have lived beside a great lake. 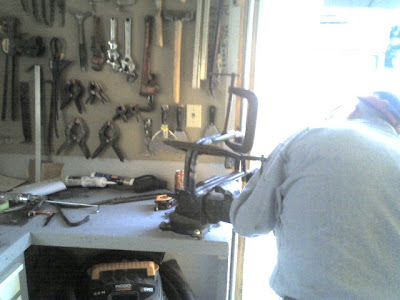 My dad's had a garage in the back forever with every tool imaginable. So, when Trevor and I set to it today it was quite easy to strip down the bikes, drill through the subframes, and replace the brakes. And it made it easy for my dad to fashion some pannier racks when he got home from work. I should hope for sunsets this nice on the continent. My dad and I picked up the bikes from the Toy Doctor tonight. If you're ever looking for a bike mechanic around North Bay, Mark Jasmin's your guy. He gives a great rate, works quickly, and is super friendly. He gave the bikes a good working over and they're running great. And he gave me a pile of stickers and a sweet shirt. It will, no doubt, make an appearance in our pictures. Thanks, Mark. It was a wonderful night in the Bay. While it was a cool 8 degrees, there was a great sunset, a calm lake, and not a cloud in the sky. I took Sam's bike out for a test ride (I wanted to practice wheelies in oncoming traffic). It's running quite well. As importantly, I gave the great jacket First Gear has given us a good test run. I was fine despite the cold, especially because of the built-in hood. No wind gets through this thing, I tell you. I look forward to trying it out in the rain. There will be lots more on the bikes in the days to come, as we'll be making final modifications and crating them up. If you're not into gear discussion, stay tuned. I'll have another bike story up next week, and as soon as the bikes are shipped we'll begin writing about the trip in greater detail. PS If you want to get in touch with the Toy Doctor, he's at (705) 663-2361. He's in Redbridge, just 10 minutes outside of North Bay on the way to Quebec. I am back in the Bay and the bikes are getting ready. My father and I shipped my bike back to Montreal (it's the sleeker of the two) and we pulled Sam's out of storage. I spent Saturday making a few small repairs, changing up some handlebars, cleaning air filters, charging batteries, etc and then taking both bikes out for a ride. Then I dropped them off at a local shop on Monday to get the real work done. The bikes are back in the garage tomorrow at which point my Dad, Trevor, and I will start swapping in a lot of the parts we've received from A Vicious Cycle. Among the things we'll be swapping in are some great tires. We'll write about them more soon. They're that awesome. Our departure is less than two months off. Miles to go before I sleep, as Frost said. But we're getting it all together. We'll keep you up to date on our preps and packing. As always, tips are welcomed.